What am I hoping to achieve with social media and my interest group, Writing Interest Group (WIG), formerly known as Competition Writing? Why am I insisting so much on the students’ participation in the comments section of the Facebook Group or the blog, Unicorn Express? The screen capture below gives a clue. 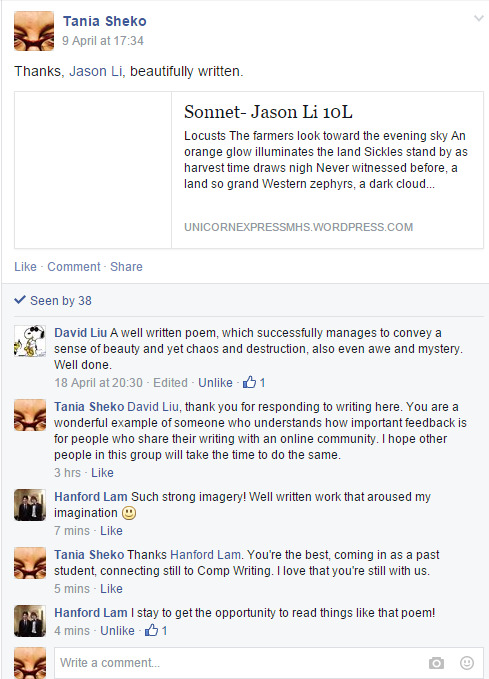 I had shared on Facebook Jason’s blog post (sonnet). I stay to get the opportunity to read things like that poem! Infographic created by Kevin Hodgson, one of the facilitators of Digital Writing Month. It’s been a pleasure taking part in Digital Writing Month #digiwrimo for the first time. 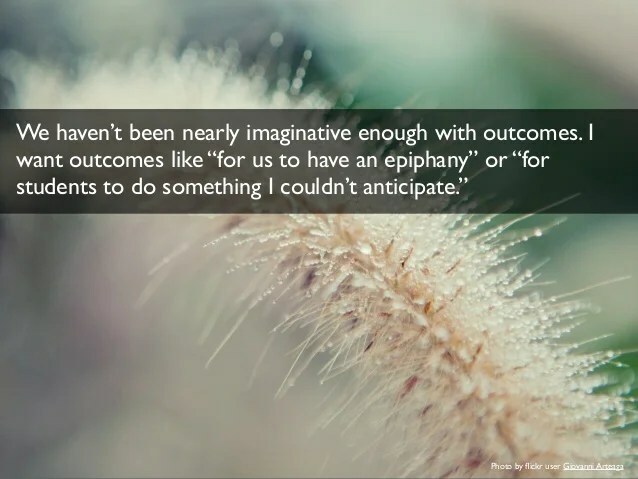 This kind of professional development is rich and leads to more connections with people who are interesting, creative and generous with their readiness to collaborate and share. I learn so much from these people during the activity and then continue to do so on social media so the learning never stops and the relationships keep developing. My interest group, WIG (Writing Interest Group formerly known as Competition Writing Group), directly benefits from the ideas and resources I glean from my participation in Digiwrimo, and of course they benefit from me being inspired and passionate about writing and connectedness of writers. Next year I hope to draw on the ideas shared in Digiwrimo and other MOOCs to introduce new, engaging activities to WIG students, as well as share these things with English teachers. My contribution to the Storyjumper (Chapter 10 of 26), a global, collaborative digital story which I’ve written about here and here. For me, the best and most satisfying professional development is immersion in collaborative activities with people all over the world – something that leads to ongoing relationships through the use of social media. This is learning from and with people, not just a one-off session about discrete skills or content. 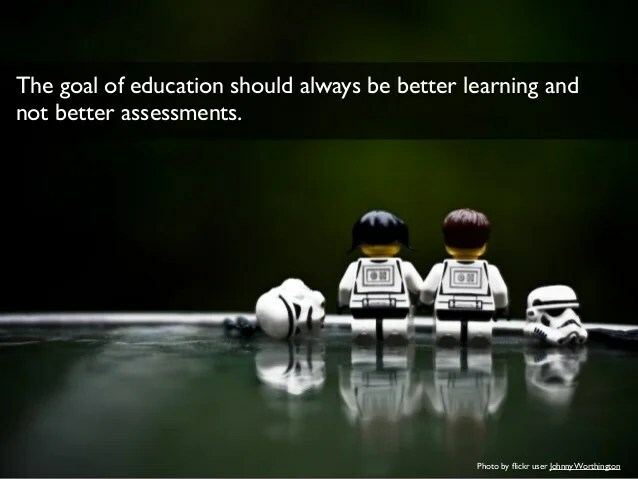 Surely one of the best ways to understand how students learn is to become a learner yourself. If we’re preparing our students for their world then we need to practise some of the 21st century skills ourselves. When you take part in online courses you are using digital technologies to connect to others – wherever they are in the world – and you are learning how to communicate using contemporary language, adjusting style and tone, including other media to your text. You are also taking on the vulnerability that students experience when they share their ideas or write a creative piece. Don’t tell me you cannot form a relationship online. Connected Courses, Rhizo15, CLMOOC – all of these MOOCs led to ongoing connections with people, some which I consider as friends. You can define friends in different ways, but when you know how a person thinks, what their interests and passions are, and you discuss with them what matters most to you in your personal and professional life – then you probably know some of these people better than you know your colleagues at school. What I do online always informs and enriches what I do as teacher librarian at school. I met Laura Gibbs during a MOOC called Connected Courses and follow her on Twitter and Google +. Following someone is a lot more specific than it sounds. When you follow someone online you keep track of what they share – be that ideas, opinons, expertise, questions, or resources. In Laura’s case, apart from the richness of her shared expertise and resourcing, I have recently linked to her extensive online treasury of mythology, folklore and fairytales in a Libguide which I’ve shared with our English/Literature teachers. Laura’s life work resides in this collection and she is more than happy to share it rather than restrict it to her own students. In fact, she is excited that her work will be used by Australian students and teachers. Laura is only one of the many people I’m happy to know online. I recently reflected about the value of relationships on social media when preparing a 7 minute talk for the TeachMeet my colleagues and I are organising for tomorrow. The post is extensive and I’ve tried to capture the essence of why I value my social network. You can read the post or look through the presentation below. Maha Bali is another person I met online, someone I call friend. I’ve interacted with Maha through several MOOCs, regular Twitter conversations, and through my recent involvement with Maha’s incentive, Virtually Connecting. Maha has written a great post in which she thinks about what it actually means to know someone online. I can “know” some people online, through their writing, better than people I know face-to-face in some ways. I’ve made wrong assumptions, sure, but that happens face-to-face as well. Is it because online, text forces you to make some parts of your thinking more explicit? Is it the distortion of time/space that occurs online, that allows one to have a continuous conversation over days or weeks, during the wee hours of the morning, while in the car or at work or in bed, when our defenses are down? You can’t have that in real life except with a family member or roommate, and it would seem to be stifling to have it with that many people. But online, it’s not. Amongst other things, Maha was part of a MOOC cohort (Connected Courses) which joined me in rewriting a short play I’d written – and we ended up recording our parts in a radio play – even though we lived in different parts of the world. That was one of the most creative and collaboratively satisfying things I’ve ever done! Wouldn’t it be amazing to enable our students to do something similar? 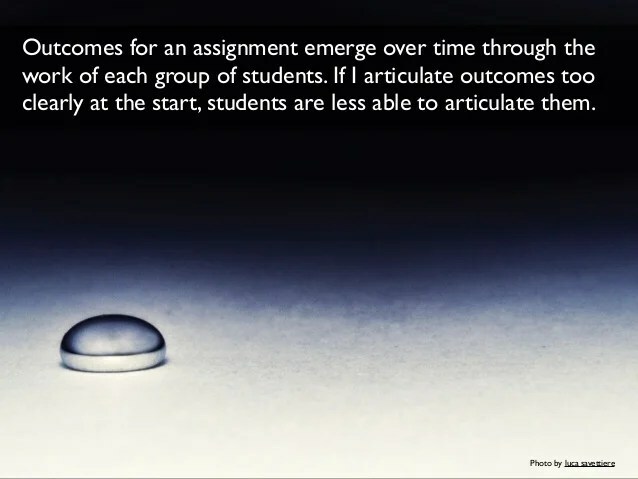 This image is from a Slideshare presentation, Emergent Learning, by Jesse Stommel and Amy Collier. 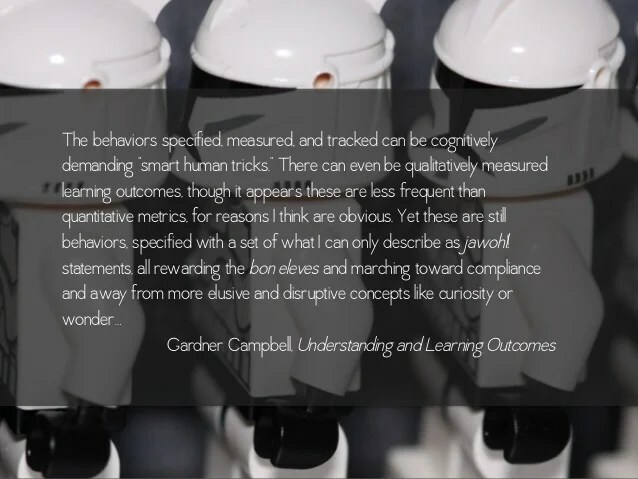 When designing and evaluating my student survey I started to think about how we might gain insight into student learning so that we can design surveys that produced valuable data to inform our teaching philosophy. I found the ideas by Jesse and Amy to be worthy of consideration. Here is the link to the complete slideshow. 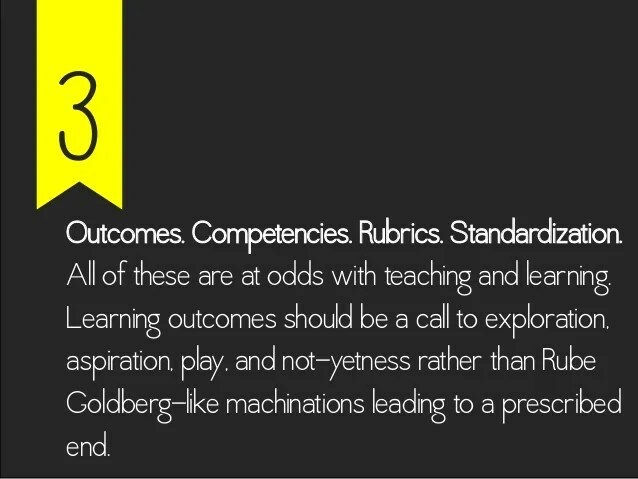 I was going to pull out a few slides that resonated with me regarding student learning, assessment and learning outcomes, but there were so many and I included most of them. I had several ideas for what I could present at our Professional Exchange sessions in term 4 2015. Most of them centred on examples of learning technologies that could potentially enhance teaching and learning, for example, different technology tools to be used for collaborative online annotation, or ways to bookmark and curate websites in the Cloud. It was on my mind through the term 3 holidays but I kept thinking that I really wanted to offer a session just for teachers, just for their own learning and enjoyment without it always being related to their teaching. In the end, after changing my mind a few times, I decided to take a (big) risk and offer a writing challenge. I wrote about it in this blog post. Of course I had to do it myself before I expected anyone else to do it. I was worried that nobody would turn up for this session because I’m guessed they might either not see the point or else be intimidated by it. In fact there was a good turnout for the session (thank you!) and we had a lot of fun together. You can read about it here. I surveyed the members of my co-curricular group, Competition Writing, and also my leaders. Eleven students responded to the survey. A summary of responses is linked here. My survey of the group’s leaders: Zachary Sunter (Captain), William Lim (co-captain) and Eeshan Dhingran (co-captain). Two of the three leaders responded to the leadership survey. A summary of responses is linked here. Students enjoyed interaction and discussion just as much, or even more, than formal learning about writing technique. This year I asked the leaders to ensure that students spent at least part of each session writing and not just listening to presentations. This was one of my goals as there was a poor balance between interactive and passive activities in the previous years. I have been pleased with the amount of active participation this year although students are usually happier to write than to take part in discussion. The leaders were very well liked this year and with good reason. The leaders themselves also enjoyed their roles. I think the language they used in their responses (‘egalitarian’, ‘cooperation’ and ‘interpersonal skills’) indicates they understand that leadership is about service and collaboration. The leaders worked hard to generate enthusiasm for writing within the group. Most challenging for them was juggling their time between academic and leadership commitments, as well as engaging the group and organising interactive activities. I was pleased that leaders found leading the sessions less intimidating than they had expected – I was aware of the shyness of the captain and one of the co-captains, and put my trust in them as young men who would nevertheless demonstrate important leadership qualities. They did not disappoint. Interaction within the Facebook group continues to be problematic, and the leaders’ survey responses conveyed an awareness of this also. As I am regularly reading other educators’ observations about the encouragement of deep conversation online, I am aware that this is one of the hardest things, and requires in-context explicit teaching and practice. Some people mistakenly think that this generation is digitally savvy but fail to realise that their digital behaviour does not include interaction on a deeper level. The same goes for reading others’ blog posts (shared in the Facebook group) and commenting. It’s difficult to break out of the traditional one-way direction of writing for your teacher. Students have been constantly encouraged to read posts shared by their colleagues and leave some feedback. This actually occurred rarely, especially the feedback (again, traditionally the domain of the teacher), and usually only by the leaders. There is a lot to be said about the value of blogging – when successful – in the way that it encourages collaborative reading and constructive feedback which require students to learn how to reflect and evaluate other’s writing, and therefore gets them to think about what constitutes good or poor writing. 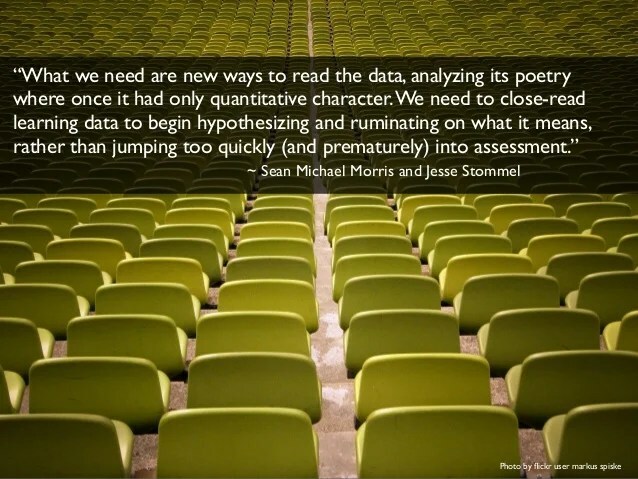 This is one of the reasons why I try so hard to convince English teachers to use blogging for all student writing – if only to have the class read each others’ work and learn how to evaluate it. 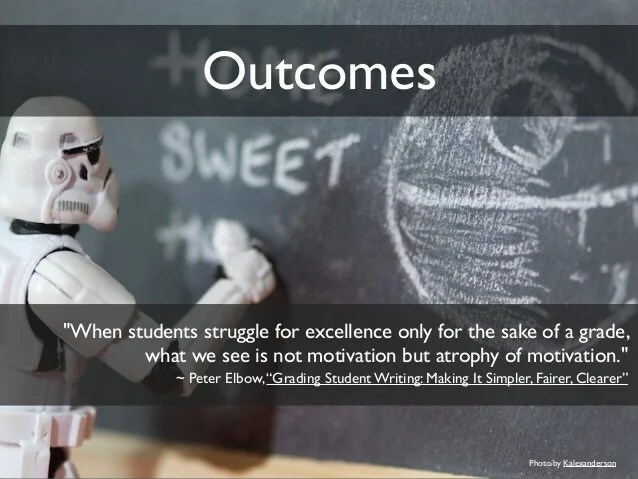 The latter is much more valuable than just submitting work to the teacher and receiving feedback from one teacher which is a passive activity.